Astronomy has been my hobby since childhood. Years before I came to know Christ, I was fascinated by the violent collisions of galaxies, explosions of stars, and implosions into neutron stars and black holes. On the one hand, these cataclysms declare God’s greatness. On the other hand, they reflect something that is out of order in the universe on a massive scale. In Isaiah 65:17, God says, “Behold, I will create new heavens and a new earth." This corresponds to Genesis 1:1, indicating a complete renewal of the same physical universe God first created. The new heavens will surely be superior to the old heavens, which themselves are filled with untold billions of stars and perhaps trillions of planets. God’s light casts the shadows we know as stars, the lesser lights that point to God’s substance. As the source is greater than the tributary, God, the Light, is infinitely greater than those little light-bearers we know as stars. On the inside of my office door is a beautiful photograph of a menagerie of several hundred galaxies (there are more than three thousand detectable in the full picture), averaging perhaps a hundred billion stars each, never seen with any clarity until photographed by the Hubble space telescope. 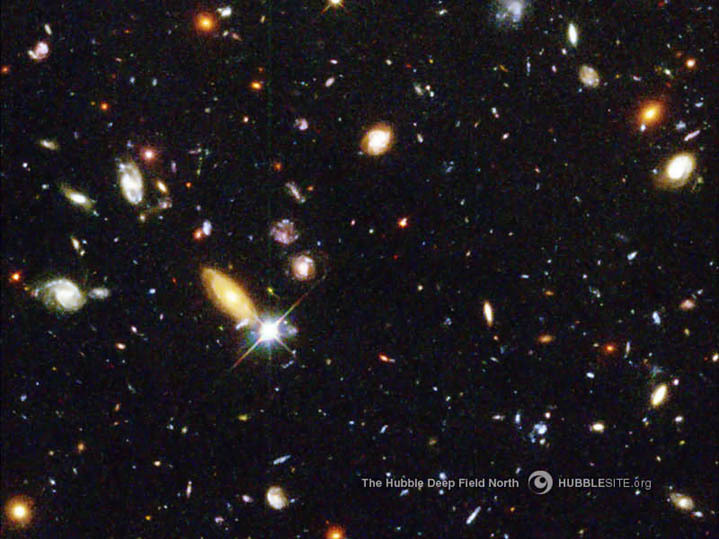 The photograph represents the deepest-ever view of the universe, called the Hubble Deep Field. In addition to the spiral and elliptical shaped galaxies, there’s a bewildering variety of other galaxy shapes and colors. This is a tiny keyhole view of the universe, covering a speck of sky one-thirtieth the diameter of the moon. When I look at this picture, I worship God. We are not past our prime. The earth and planets and stars and galaxies are not past their prime. They’re a dying phoenix that will rise again into something far greater—something that will never die. I can’t wait to see the really great meteor showers and the truly spectacular comets and star systems and galaxies of the new universe. “The heavens declare the glory of God” (Psalm 19:1). So too do the accomplishments of mankind whom He created in His image, and made to reflect his glory.